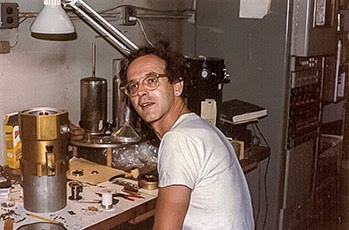 "I guess today's experimenters build things in software, without ever touching a soldering iron. The hocus pocus is inside the program. It's cleaner this way -- nothing to burn or zap, and you don't need a voltmeter... What happened to home-brewed and breadboarded circuitry? Where's the joy of mechanics and electricity, the creation of real things? Who are the tinkerers with a lust for electronics?" I've had a few emails regarding the modular BiTX build and I probably should clarify a few things. First, ON6RF has posted his gerber files on the link at Hackaday.com that I originally posted - just scroll down to around the middle of page to the 'Files' section. Since he has placed these in the public domain they are available to anyone that cares to download them. But, because it is HIS work, I'm not comfortable forwarding the files myself. I don't know if he follows it but I'm sure that he can keep track of how many downloads have occurred and I'm certain he would be gratified to know that his work is appreciated. What I have offered is to make my gerber file for the motherboard available and, if I can manage it, I will post it here in the files section in the Modular BiTX folder. I will also include the pdf files that I created for each of the module showing component placement and values. As for acquiring the circuit boards, as I stated earlier, I use PCBWAY.com for production. Their prices are excellent and the turn-around time is hard to beat. The cost of the panelized pc board for me was $5.00 for 10 boards with DHL shipping costs of $22.00 for a total of $27.00. I ordered the boards late on a Monday and DHL delivered the finished boards the following Monday morning. Their website says boards that measure 100X100 mm or smaller cost $5.00 for 10 boards so whether you order 1 or 10, the cost is the same. To complete the build you will need 3 boards to have enough bi-directional amp modules so, if you're interested in following thru with building a modular version, you could perhaps join with two other interested parties and split the cost between you. 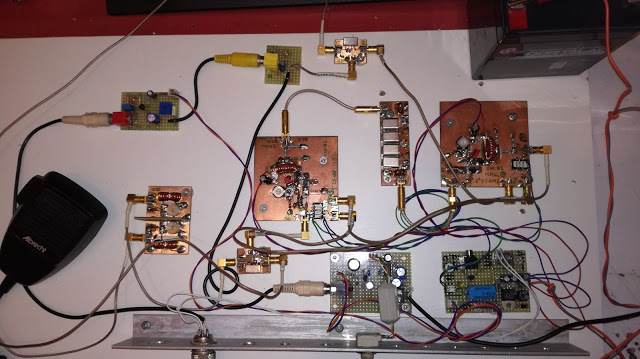 With 3 boards you will be able to build a complete transceiver and have 2 extra modules for experimentation for every section except the bi-directional amps. As an example, on my first prototype I built the double balanced mixer as designed and a second one using an ADE-1 to compare the results. For the record, there was absolutely no noticeable difference between the two. I also built a 4-crystal filter as designed and an 8-crystal QER filter on a second board for comparison. There was a definite difference between these two modules. I hope this clears up some of the questions and I'm still available via direct email to answer questions specific to my build or class presentation. I'm currently working on the assembly manual for my class and when finished I will post it also in the files section. -- Ron used a DX-100. FB. 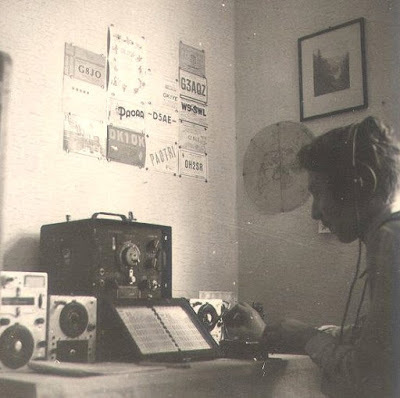 -- Ron was active on the satellites. In his voice you can hear the joy and the burst of enthusiasm that resulted from those early satellite contacts. He also mentions the untimely demise of Oscar 13. Bummer. -- Ron was the Israel correspondent for 73 Magazine. I held a similar position in Dominican Republic. My friend David Cowhig was at the same time correspondent from Okinawa, Japan. We should have a reunion of "73 Magazine Hambassadors." -- Ron mentions John Tait EI7BA. John was a regular contact of mine when I was in the Azores. He appears in the SolderSmoke book. He was the one who introduced me to an important Irish accolade: John told me that WD-40 is "the Pope's pee." 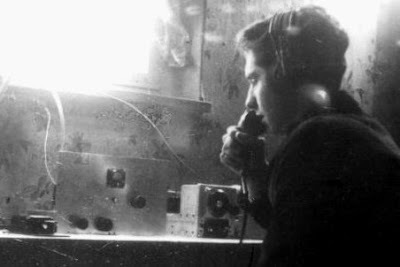 -- Toward the end, Ron discusses the wonder of ham radio conversations, and provides a good suggestion on how to get beyond the all-to-common "hello-59-goodbye" contacts. Ron's comments on the spiritual or philosophical aspects of the hobby were just the thing for a quiet Sunday morning. Thanks to Eric and to Ron for a great interview. 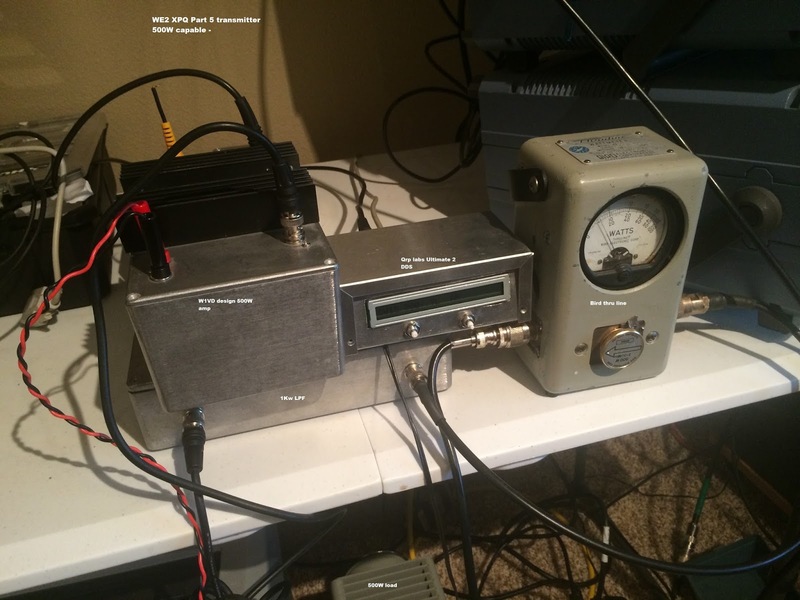 BITX40 Featured in "Nuts and Volts"
Congratulations to Steve Jackson and to "Nuts and Volts" for putting out a very nice article on the BITX40 transceiver. Steve did a great job in describing the origins of the BITX, and in explaining that Farhan's intent is to encourage experimentation and tinkering. Pete and I had pitched a similar article to a major ham radio magazine but sadly they were not interested. Three cheers for "Nuts and Volts." I'm thinking about subscribing. I know many of you will wince when you see Steve's unshielded mic cord lying right next to the front panel antenna connector, but please don't freak out about this -- in the article you will see that Steve acknowledges that the antenna connector would have been better placed on the back of the box. That's an example of the educational value of the BITX40 -- live and learn. Even with the connector like this, Steve was making many contacts. The "Nuts and Volts" website very kindly let me read the entire article without a subscription. Hi Bill - It's been a few years and I'm sort of glad my global wanderings have been curtailed to a point and I'm now based out of Alaska and via a couple of call signs (KL1X KL7UK etc) have ended up with KL7L. I still travel with the Oil Company but no China on the horizon. I had a chuckle when you and Pete mentioned the new 630 and 2200m bands - and the real estate requirements - Well, I've been active with the experimental callsigns since 2003 and very glad we have finally got the bands - so a small form to fill out on the UTC web site and a 30 days wait to check you are not within 1Km radii of the co channel PLC on Trunk power lines, if no "disapprove" away we go - and I and many have! The station for both band is homebrew soldersmoke heaven - transverter/PA and filters/Couplers/Phase meters etc with only my ol' TS850 doing the prime driving, or a Hans Summers U3S. Size does matter - but my best RX for both bands is a 2ft long active probe up a pine tree, that's all - and some 300ft of RG6, and the Tx antenna is a 60ft high Marconi or more over an inverted L with a 3 wire top cap all nested in the Birch forest - loads or radials but still very lossy in the Summer - nothing special here - Of course with the QRP per se we have to use CW or digital modes mostly but DX can be done - after all my closest active neighbor on 2200/630m is over 2000Kms away! So, for the first time I sparked up on JT9 on 630m this early morning and first blood to QSO with VK4YB @ 5W EIRP! Not bad for a first qso on what is a fairly typical back yard antenna - so, there is hope and many people appear to be putting transcontinental signals out this power, so everyone is on the same playing field - just the ground and location and latitude will change things! It tends to be more flaky, lossy and geo/solar events tend to hit us hard up here compared with say Seattle. On 2200m TX its a loop of thick wire hanging in the trees - literally 500ft circumference and a beefy coupler to deal with the 50A or so of antenna current to make the 1W ERP or so - still its getting out OK and again should be putting signals over the Pole to EU and across the Pacific as it becomes more and more dark up here. The Woz scared me for a second -- I tought he was going to leave a hot iron on the desk amidst paper and other flamable items. But no -- he put the soldering iron in its holder. Later we hear Woz talking about the need to update schematic diagrams. And I was esepcially taken by the use of wooden enclosures for electronic projects. My BITX rigs have followed the Apple example. 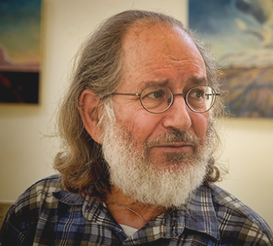 Hack-A-Day had a piece on Cliff Stoll of "The Cuckoo's Egg" and "Silicon Snake Oil" fame. I read these books years ago. I included a quote from Cliff on page 45 of the SolderSmoke book (the quote seemed to foreshadow my aversion to SDR). I didn't know that NOVA produced an hour-long program on Stoll's Cuckoo's Egg adventures. It is really good. Many of those involved play themselves in the video. Very cool. See above. I checked Cliff's QRZ.com page. We wrote several years ago that Cliff has THE KNACK. Note below his preference for thermatrons and the affection for Heathkits. Diagnosis confirmed. Way back in the Jurassic, I was licensed as WN2PSX, in Buffalo NY. Got my general ticket around 1967 as WB2PSX, and helped build ham radio stations at Hutch-Tech high school, University/Buffalo, and University of Arizona. When I went to Tucson for grad school, I passed my extra ticket and snagged the call K7TA (back when this meant 20wpm cw). I held a first-class commercial ticket, which let me engineer at WBFO radio, but I don't know if commercial licenses even exist anymore. I now live in Oakland California, and occasionally get on the cw lowbands with old heathkit gear ... just rebuilt my novice NC-270 receiver with filaments that glow in the dark. Gotta restring my 40 meter dipole that came down in a windstorm. I'm a few days behind on this. On October 18 Bob Crane pointed out that Garrison Keillor marked the anniversary of the broadcast band "transistor radio." I had mine (a 1970s version), and it did indeed allow me to listen to that seditious rock music without parental interference. Looking around the shack, I still have items in use that have "Transistorized" as part of their product name (like my Lafayette Radio Electronics Transistorized DC Power Supply." It was on this day in 1954 that the first transistor radio appeared on the market. Transistors were a big breakthrough in electronics — a new way to amplify signals. They replaced vacuum tubes, which were fragile, slow to warm up, and unreliable. During World War II, there was a big funding push to try to update vacuum tubes, since they were used in radio-controlled bombs but didn't work very well. A team of scientists at Bell Laboratories invented the first transistor technology in 1947. But the announcement didn't make much of an impact because transistors had limited use for everyday consumers — they were used mainly in military technology, telephone switching equipment, and hearing aids. Several companies bought licenses from Bell, including Texas Instruments, who was bent on being the first to market with a transistor radio. Radios were mostly big, bulky devices that stayed in one place — usually in the living room — while the whole family gathered around to listen to programming. There were some portable radios made with vacuum tubes, but they were about the size of lunch boxes, they used heavy nonrechargeable batteries, they took a long time to start working while the tubes warmed up, and they were fragile. Texas Instruments was determined to create a radio that was small and portable, and to get it out for the Christmas shopping season. They produced the transistors, and they partnered with the Regency Division of Industrial Development Engineering Associates, who manufactured the actual radios. Their new radio, the Regency TR-1, turned on immediately, weighed half a pound, and could fit in your pocket. It cost $49.95, and more than 100,000 were sold. Texas Instruments went on to pursue other projects, but a Japanese company called Tokyo Tsushin Kogyo decided to make transistor radios their main enterprise. They were concerned that their name was too difficult for an American audience to pronounce, so they decided to rebrand themselves with something simpler. They looked up the Latin word for sound, which was sonus. And they liked the term sonny boys — English slang that was used in Japan for exceptionally bright, promising boys. And so the company Sony was born. Soon transistor radios were cheap and prevalent. With transistor radios, teenagers were able to listen to music out of their parents' earshot. This made possible the explosion of a new genre of American music: rock and roll. Was the young lady turned off by his obvious "appliance op" status? Was it the Baofeng? Would he have fared better with a homebrew rig? I blame Peter VK2EMU for this digression. -- Old friends on 17 meters. -- Another Knack Nobel in Physics. -- Hans Summers' QCX transceiver: $50 IS THE NEW 10 GRAND! -- New Bands! 630 and 2200 Meters. BIG ANTENNAS! 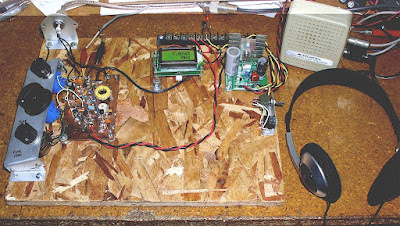 -- Nuke Powered QRP. No joke! -- The Challenge of UHF. Not for the faint of heart. -- Reginald Fessenden, Father of Phone. PETE'S BENCH REPORT: The New Simple-ceiver. Soon to be a Transceiver. BILL's BENCH REPORT: Discrete, Direct Conversion, Ceramic Receiver in iPhone Box. HOW TO TROUBLESHOOT A HOMEBREW RECEIVER. The eagle eye of Brent KD0GLS spotted this frame in the 007 movie "Casino Royale." Wow -- I just knew those GQRP guys had to be much cooler than they seemed. I guess there were some indications: They do seem to talk quite a bit about "Q". There is that weird fondness for Parasets. I understand that several of the senior GQRPers drive Aston Martins. And that Dobbs guy -- a kindly retired Anglican minister you say? Really? I can just hear him saying it: "Dobbs, George Dobbs." I had a very nice contact on 17 meters yesterday with Jan DL1YC. 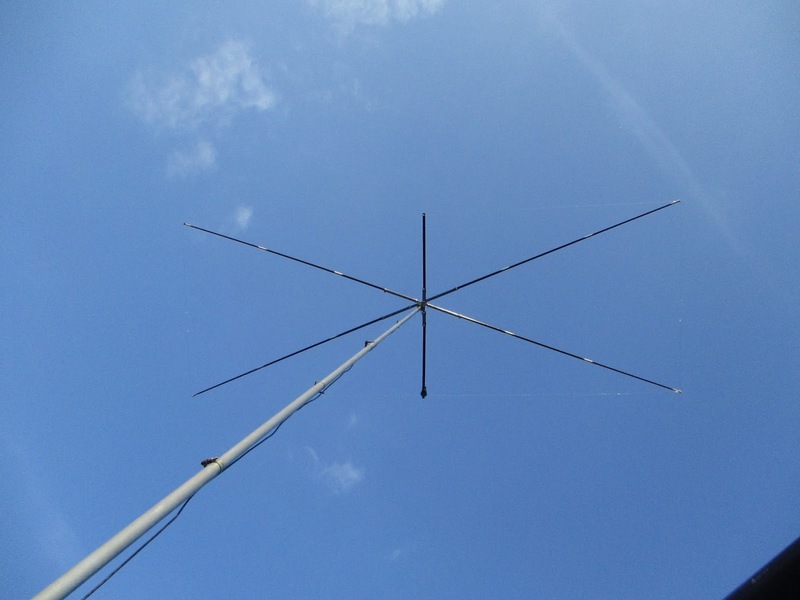 It was a rare Moxon-to-Moxon contact, with homebrew 17 meter Moxons on either end. Jan's is a bit cooler than mine: His is flat, without the "blownout umbrella" support that we see in mine (below) and in the Hex Beams. Jans told me that he achieved this flatness by starting out with very long telescoping fishing poles -- he discarded the the thin portions of the pole and used only the more rigid pieces. (I used 16 foot, 5 piece Shakespeare Wonderpoles from Amazon.) I think he also used thin wire for the elements. The crossbar that you see in the picture above is there to support a balun at the feed point -- without the cross bar the balun and the feedline would cause the balun to droop. I couldn't resist a little front to back testing. Jan's antenna does not have a rotator -- he used the "Armstrong" method of antenna pointing. I didn't want to make him go outside to spin the thing around by hand, so I just turned mine and asked him to take note of the difference front to back. He saw 3 S units. 18 db. Not bad. Jan said his antenna weighs about 8 pounds -- mine is very similar at 9 pounds. Jan expressed some concern about UV deterioration of the fishing pole fiberglass. Mine has been up there three years without any problems. Like me, Jan had considered "nesting" an element for another ban (perhaps 20 or 12) but -- like me-- had concluded that this would be too difficult. Well, really a DC receiver in an iPhone box. I think the Apple iPhone boxes have great potential as project enclosures. They are cardboard, but they are very rigid and solid. I decided to use them for a Direct Conversion receiver project I've had in mind. This is a 40 meter DC receiver. No chips. Ceramic resonator VXO tuned by a varactor diode. 9V battery as the power source. Ear buds as the transducer. Passive, two diode, singly balanced detector. It sounds great -- so great that I may have to add a gain control. The nice fit is no coincidence -- I cut the board so it would fit in the iPhone box. Take a look at that top cover. It is all, well, empty. I could put another board in there, right? Maybe a balanced modulator, a mic amp and an RF amplifier. Then this thing would be a Double Sideband transceiver. We could even make use of the little microphone that comes with most of the ear buds. I'm thinking that this might be the kind of project that people would like to take on this winter. Build the VXO first. Then the AF amp. Then the product detector and front end. At that point you've built a receiver. For extra credit you could go on to the transmitter. No need to use Apple boxes (but they are cool...) I will try to get the schematic done soon. My nephew John Henry will test the prototype. Thanks to W8SX for alerting me to this. There is a lot of good stuff on Roberto's site. He obviously has THE KNACK. This is Clark, VE3BOF, in Hensall, Ontario, Canada. hour drive west of Toronto. the BitX40 net. I heard you and 2 or 3 others. Your signal was 5-7, perfectly readable. The receiver I was using is a modified version of the WBR receiver. onto. It's an excellent little regenerative receiver. I use this receiver for the CW end of the 40M band. and also lcd frequency counters for displays. of Health emergency services radio system. The family soon had to flee again, when U.K. Prime Minister Neville Chamberlain signed an accord ceding parts of Czechoslovakia to Germany. They heard the news on the night of 30 September 1938, while on vacation in the Tatra Mountains in Slovakia. As Chamberlain’s address blared from the hotel’s massive radio, 6-year-old Rainer stared in fascination at the glowing array of vacuum tubes inside the cabinet. The hotel emptied overnight as people fled to Prague. He applied to MIT to study electrical engineering so that he could solve a problem in hi-fi—how to suppress the hiss made by the shellac records of the day. But electrical engineering courses disappointed him, as they focused more on power plants than on hi-fi. So Weiss switched to physics—the major that had, he says, the fewest requirements. I came across OM F5LVG's work in SPRAT. He has a wonderful website -- it is in French, but Google Chrome translates is quite nicely. 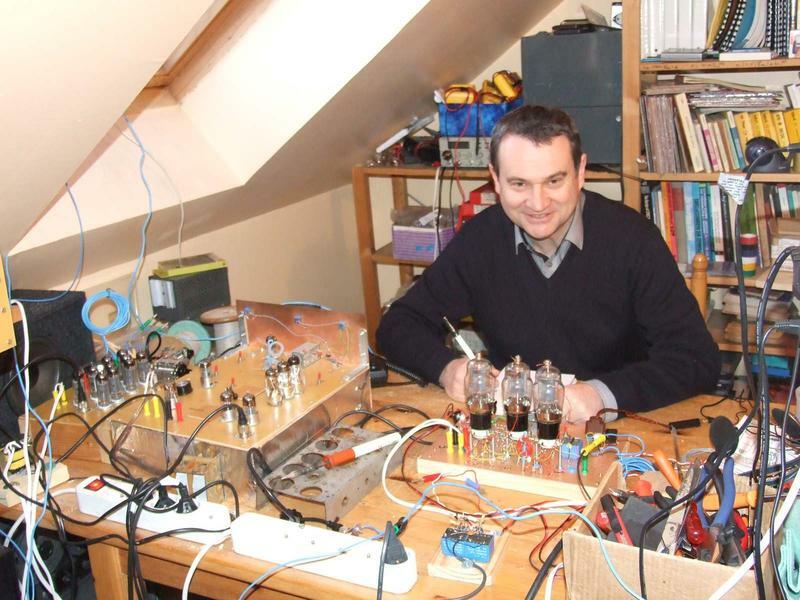 This site is dedicated to the construction and understanding of radio receivers. 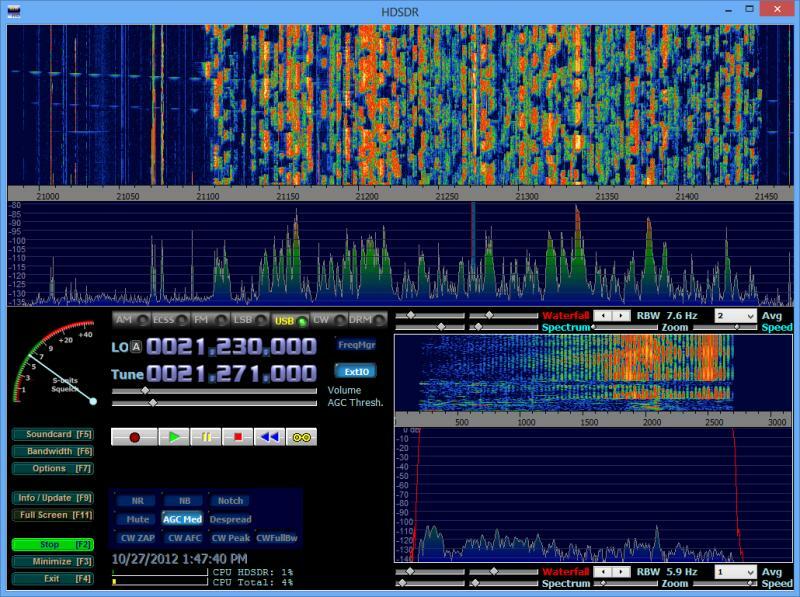 If you have dreamed of hearing a radio station with a receiver that you have built yourself, this site is for you. These are essentially direct conversion receivers and modern feedback detectors using only semiconductors, except for retrofitting. The described stations will accommodate amplitude modulation, single sideband (SSB) and telegraphy. Besides these receivers several articles are devoted to LC oscillators. In particular, an extremely simple original stabilizing device is described. Similarly, a simple frequency meter is described. The joy of reception using a homebrew receiver is intense. May this site help you find this joy. Do not hesitate to join the amateur community. At the instigation of Bob N7SUR I've been working on a simple, easy-to-reproduce Direct Conversion receiver for 40 meters. I'm building this for my nephew John Henry, and I'm hoping this will be a circuit that others can use to break into the ELITE corp of successful ham receiver builders. Coincidentally Joh in Freiburg Germany is working on a very similar project -- we have been comparing notes. At first I used an FET detector described by Miguel PY2OHH. 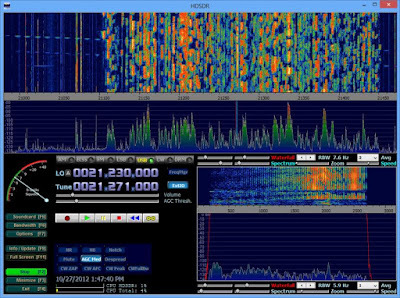 It worked, but at night the AM detection of powerful shortwave broadcast stations drowned out the amateur signals. So Joh and I started to explore detectors that would eliminate this problem. 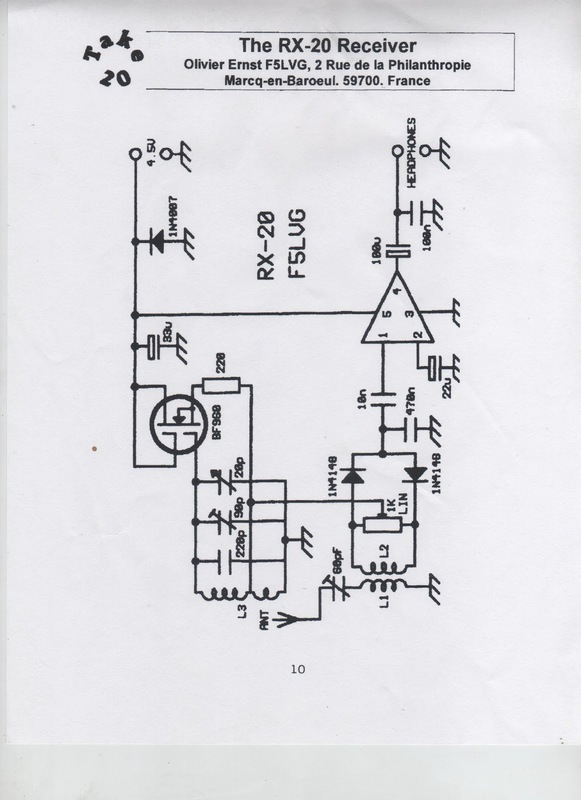 I went with a version of one described in SPRAT by F5LVG ( "The RX-20 Receiver"- see below). Very simple: A transformer to two back-to-back diodes with a 1K pot to balance the signal from the VFO. OM Olivier used a very, very cool transformer: he took two small, molded chokes and simply glued them together! 22uH choke as the primary, 100uH choke as the secondary. I went with one of the toroidal transformers that Farhan left me when he visited in May. I'm using a varactor-controlled ceramic resonator VXO (no Si5351 in this one!) and a non-IC AF amp designed for use with ear buds (the world is awash in ear buds). It is a "singly balanced" design with the incoming RF signal being the one "balanced out" in the detector. Last night the receiver passed the AM breakthrough test. The SW broadcast monsters were balanced out and kept at bay. This morning the receiver passed The Boa Vista Rooster Detection Test. I fired up the receiver and heard an operator speaking Spanish with a Brazilian accent. When I heard the rooster crowing in the background I knew it was Helio PV8AL from Boa Vista Brazil. TRGHS -- this little receiver is a winner. I'll try to post a schematic soon. And hey -- look at what wonderful IBEW (International Brotherhood of Electronic Wizards) project this is: Instigation and inspiration from Oregon. Some design ideas from Brazil. 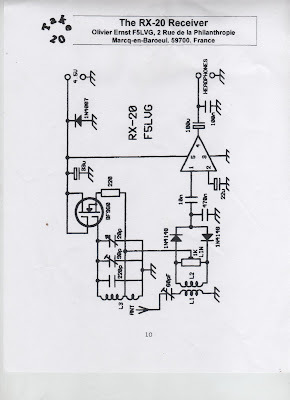 A French detector circuit described in a British QRP magazine. A transformer from India. A collaborator in Germany. And finally, the rooster of Boa Vista. Let's not forget Wes Hayward W7ZOI for bringing back (in 1968!) the neglected Direct Conversion idea. Steve VE7SL reminded us via his blog that US radio amateurs now have the use of two new radio frequency bands: the 2200 meter band and the 630 meter band. As always, Pete N6QW was way ahead of the game and is already working on a full-size 6 element quad for 2200. Good going Pete! Please send pictures (we may need a satellite photo to get the whole antenna in the shot). As Steve points out there is already a lot of activity on the new bands -- the attached pictures are snaps of just ten minutes of WSPR activity this morning.